With the new year getting well underway and all of the Christmas chocolates almost gone, it seems that my skin has had a bit of melt down due to the over indulging, and one too many lazy nights where i’ve retreated to using a face wipe to remove my makeup. 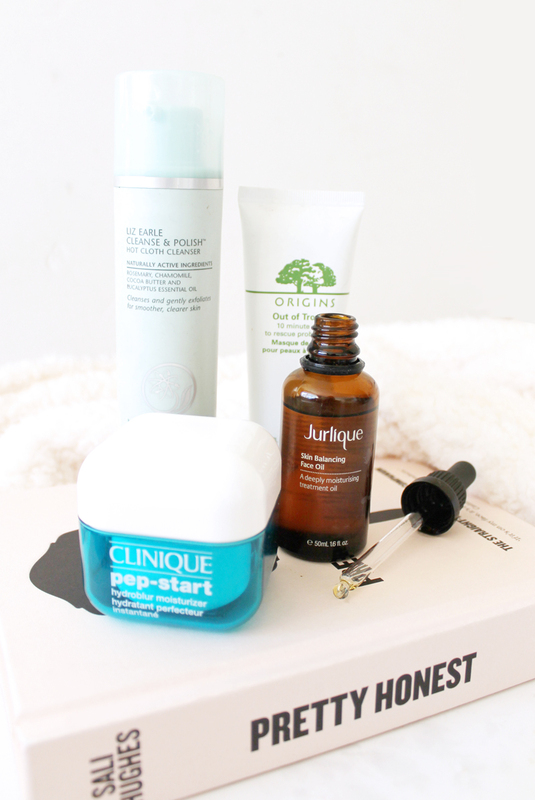 In an effort to give my skin a little detox, I thought i’d turn to some products that I know my skin loves and if you too are in need of a skin detox, then these products may be just what your skin needs. A long term cleanser favourite of mine has and probably always will be the Liz Earle Cleanse & Polish Hot Cloth Cleanser (£15.50). It works so well to really clear out all the build up in your pores, without irritating your skin or drying it out as some cleansers can. I personally love using this with the muslin cloth as it’s designed to be used, soaked in hot water as it feels amazing on the skin, almost like you’re giving yourself a little pamper session, when really you’re just cleansing your skin. The muslin cloth also helps to remove and dead skin cells, and also helps to remove any excess makeup that may still be lingering on your skin and in your hairline. If you haven’t tried out the Cleanse & Polish, i’d really recommend trying it as it is as good as everyone says it is. Another treatment that I love using when my skin is having a bit of a melt down is the Origins 10-Minute Out of Trouble Mask (£24), which works to settle and soak up any excess oil on the skin causing blemishes on the skin. What I love is that this gets to work in under ten minutes, meaning it’s super quick to use if you’re on a time schedule and knowing a product can get to work so quickly allows me to feel confident in the product that i’m using. I find using this a couple of times a week, when I need to that it helps to settle my skin and get it back to it’s normal blemish free appearance. Moving onto moisturising products that my skin just loves when it’s need of a little extra moisture, and products I know work absolute wonders. Starting with a face oil that I never thought i’d admit to enjoying as I always thought oils made your skin oilier, but the Jurlique Skin Balancing Oil* (£38) is an absolute godsend. It’s lovely lightweight yet deeply moisturising formula works to tackle signs of dryness and uneven skin tone but also works to protect the skin from the daily pollutants that it faces. I find using this once or twice a week before going to bed to really help my skin, especially when it’s going through a dry phase as it eases the dryness and leaves my skin feeling so much less irritated. The last product that although is fairly new to my moisturiser stash is one that my skin has been lapping up big time. The Clinique Pep-Start HydroBlur Moisturiser (£24.50) is one I’ve heard a lot about in the last few months, and after trying my friends I knew that I needed to get my hands on it, and I luckily got an amazing deal in the sales at Christmas. After a good couple of weeks of using this, my skin has never felt so amazing and if like me your skin is prone to dryness and/or irritation it helps to settle your skin leaving it feeling amazing. For me it’s the perfect daytime moisturiser, and I use a more thicker moisturiser at night time to give it time to sink in and works it magic.